I interrupt your regularly scheduled fitness blogging to bring you a super-awesome non-fitness announcement: my first novel is finished and available for purchase. Last April, I sat down with a friend and started writing a steampunk serial novel. And yesterday, the fourth and final part went live on Amazon. 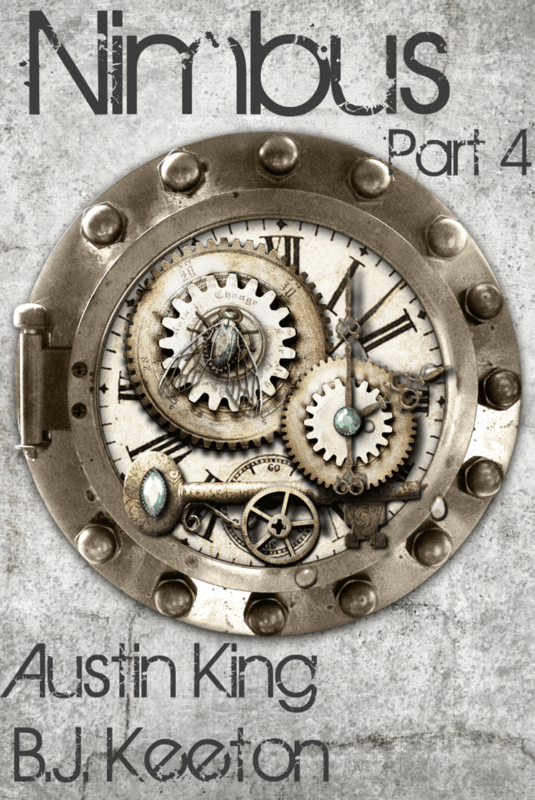 Steampunk is an interesting aesthetic with the cogs and steampower and airships, and typically, Austin and I don’t like it that much. And that’s exactly why we wrote Nimbus. We wanted to write steampunk for folks who don’t like steampunk. So if a world of steam power, airships, and demon possession sounds awesome, you can snag all the whole novel of Nimbus (four parts) for your Kindle right now. Part One is just $0.99, and if you want it for free, you can read all of Part One on my other blog, Professor Beej, absolutely for free. This may be premature, but is there a consolidated version of Nimbus? Eventually, yes. We have plans for an omnibus that collects the four serial parts, but we’re not 100% on when we’ll be able to get that out. We are aiming for the summer, I think, but it’s not the first project on our list–we both have solo novels we hope to get out there before we revisit Nimbus.